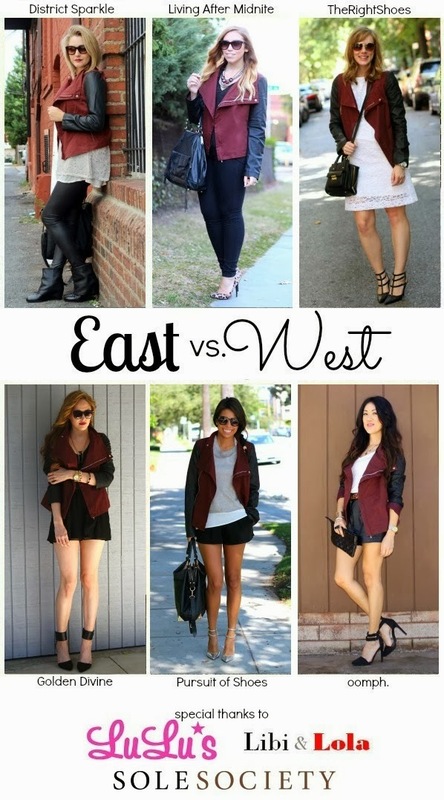 Welcome to week two of the East v. West collab!! This week we were lucky enough to team up with LuLu's to style this adorbs jacket. Notice the color theme going on - great minds think alike!!! I'm definitely not ready to put away my white lace dress so I had to use it for one more outfit photo! And this baby Phillip Lim? Isn't it great? The perfect size for brunch and strolling the West Village. Hope you had a fab weekend - tune in next week! i love the lace dress paired with the leather...perfect juxtaposition, right? heart those shoes, too! !